FIRST LILACS — PALETTE KNIFE Oil Painting On Canvas By Leonid Afremov - Size 24"x24"
I would like to present my hand painted oil on canvas painting (recreation) of the artwork FIRST LILACS. I made this piece with the same amount of soul and emotion just like the first original painting. This piece is created with oil paint on artistic canvas using my unique technique of a palette knife. The artwork has texture, you can feel the strokes by touching the painting. By purchasing on this site, you are buying directly from the artist Leonid Afremov. I guarantee your satisfaction and the best customer experience. 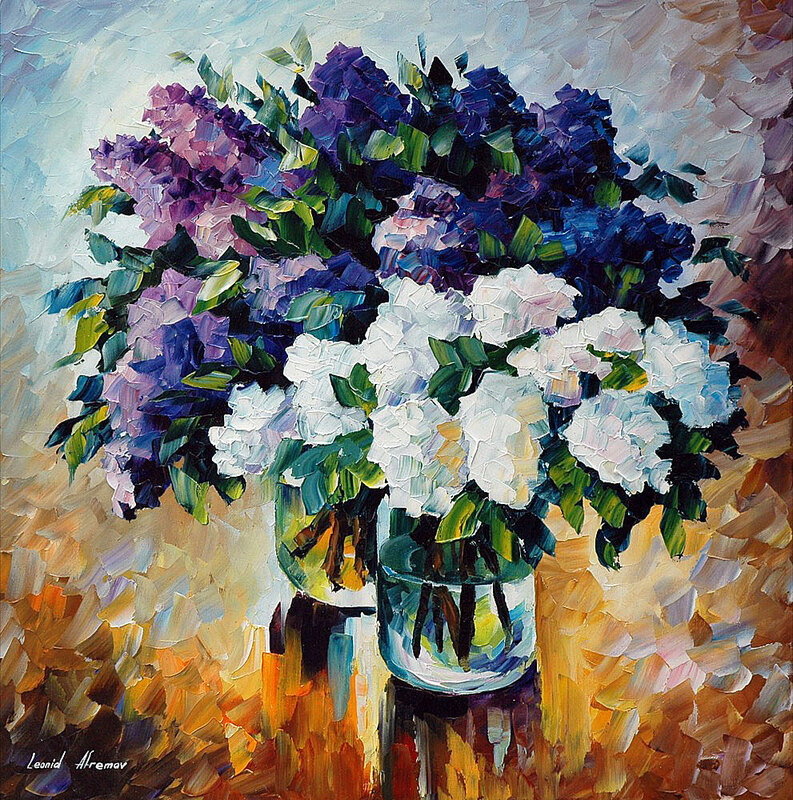 First lilacs is the name of the paintings by Leonid Afremov included into his flowers series. You can hardly find anything better among the most famous paintings of lilacs. Perhaps every one of us associates the flowering of this wonderful plant with the beginning of the warmest part of spring - the end of April – the beginning of May. It is on this period that a whole series of May holidays fall in many countries. During these holidays people can relax in nature with their relatives and friends. It is namely this spring mood that the artist tried to convey. Looking at this painting you can feel your room filling with the smells of freshly cut lilacs, you feel the approach of spring, something very warm and joyful. And in fact it does not matter what time of the year is now. These wonderful twigs of purple and white lilacs will certainly create in your soul a sense of celebration and will fill you with the brightest emotions. Be sure that the spring mood will not leave you for a long time. The painting itself is a still life depicting two balloons with lush bouquets of white and purple lilacs. The background of the picture is made in pastel colors. This adds a kind of neutrality. That's why it will look good at any time of the year. Lilacs is perhaps one the most well known spring flowers. Now let’s take a look at the other spring and summer flowers that can be planted in the garden. This might be interesting not to gardeners but to everyone who can see the beauty of the nature! These flowers strike with their bright colors. They do not require special care. They bloom throughout the summer. In the regions with a warm climate, pansies strike the eye with a wide range of colors. To date, there are a huge number of all kinds of tones and combinations of this perennial. This plant is capable of growing on the soil of absolutely any composition. In addition, it is distinguished by good frost resistance. Most often it is used for decorating rock gardens. Periwinkle is very growable. After a while, the entire area will be covered with a green carpet with blue or pink drops. An extraordinary plant that strikes with its blossoming and bright colors, it can reach 1.5 m in height. The inflorescences feel terry. By their various shades they resemble peonies, growing on high stems. The blooming period covers all the summer season, extending even to the beginning of autumn. It represents a perennial shrub that reaches 3 m in height. In this case, it can also climb. To preserve a good appearance, honeysuckle must be constantly tied and regularly cut. The flowers stand out with a special unique flavor. 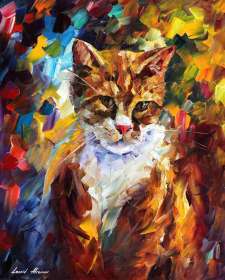 I've purchased eight paintings from Mr. Afremov, and I haven't been disappointed in the stunningly beautiful works of art, customer service, or shipping time frames yet. Every person who has walked in my house has asked about the paintings and I refer them here. I couldn't be happier with the product or the service.